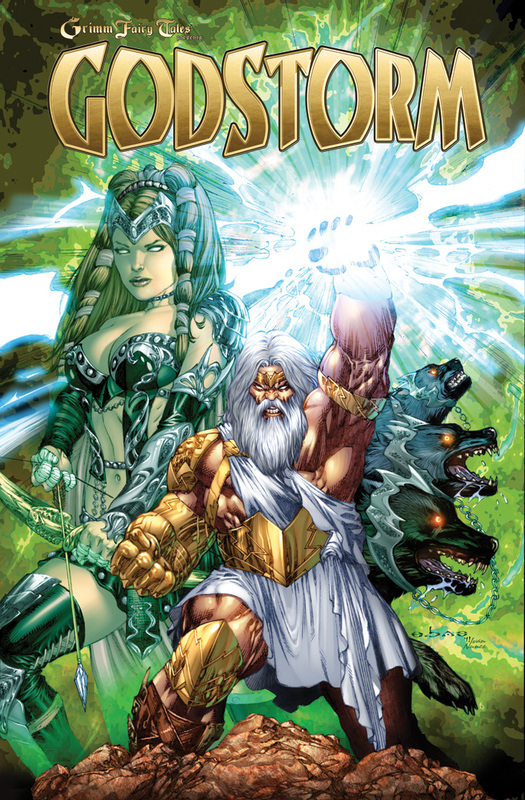 The Fellowship was fortunate enough to obtain a copy of GODSTORM #0 from Zenescope Entertainment. Pat Shand writes and Jason Johnson draws. Gregor is a very successful man, and has been for a long time, going back to when his name was Zeus (yes, Greek god Zeus). Something is starting now, though, which gives him reason to think about his children and his less-than-stellar relationships with them. Meanwhile, one of those children has decided that a return to glory is in order. She begins enlisting help from some of her siblings and sets plans in motion. This two-part story is set up as a fun way to get the ball rolling for this new series. It gives us a brief glimpse of essentially both sides of the upcoming conflict, and it does so with just enough of a tease to make it interesting. Between Zeus pining about diminished power and Aphrodite telling Ares point-blank that she doesn’t trust him, we get a better sense of the types and level of power we’re likely to see in the story. Maybe humans will have a fighting chance; we’ll just have to read the book and see. This is an exciting and well-balanced beginning to this series. Great drama potential as well as foreshadowing for an epic battle or two. I think this one will be worth reading. GODSTORM #0 is available now at your FLCS or by order from zenescope.com.